At bottom right, signed "AD. Menzel." in carpenter's pencil. In 1872 Adolf von Menzel spent several weeks in the vast smelting works in Königshütte, Upper Silesia, watching and recording German workers go about the hot, gritty work of iron production. While there he produced numerous studies for his painting The Iron Rolling Mill of 1875, which was one of the first depictions of the modern industrial worker. The careful modeling and detailing suggest that Menzel composed this drawing not on the spot but after some reflection. 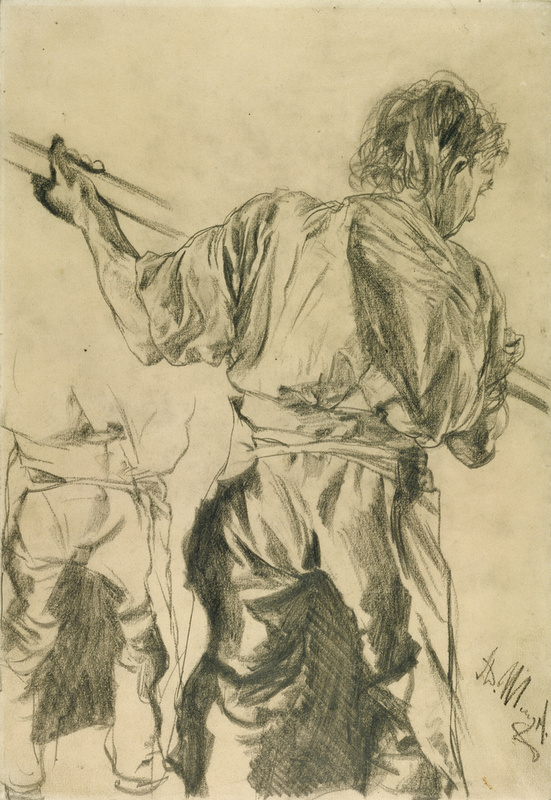 Both the shifting, fractured quality of the shadows and the roughness of the carpenter's pencil enhance the sense of the worker's heavy, physical labor. The large size and powerful stance of the figure might reflect Menzel's view of the worker as an almost mythical hero, integral to the advancement and progress of modern society. This drawing and the final painting were applauded for capturing the spirit of the age: the German people's national pride and excitement as their homeland's economy began its shift from agriculture to industry. Within a single generation Germany would become a powerful industrial state, generating wealth from coal and iron and factory production. Galerie Arnoldi-Livie (Munich, Germany), sold to the J. Paul Getty Museum, 1984.